The middle class has been at the forefront of demands for political change in Tunisia and Egypt. Now, a growing middle class south of the Sahara presents challenges for governments there, as well as a potential source of political stability. Political upheaval across North Africa is being driven, in part, by a growing middle class that wants more of a say in the way their countries are run. 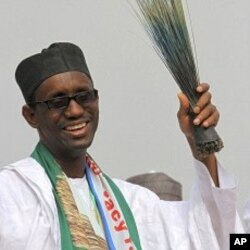 "They are tossing off decades of oppression and failed forms of governance, failed policies, failed ideas," said Ribadu. "In an exciting display of people's power, these young men and women are demanding negotiation and securing democracy through the slogan of change." Globally, the middle class, or consumer class, is considered to comprise households with daily spending of between $10 and $100 per person. They are generally a source of political stability as they are invested in their country's continued growth. But that stability depends on the depth of economic freedoms. "In the case of Egypt, for instance, the middle class grew in a political economy where the levers of power both political, security, and economic were held by a few," said Raymond Gilpin, the director of the Sustainable Economies Center of Innovation at the United States Institute of Peace. "That made it difficult for the emerging middle class, particularly over the past five years, to feel as if they are a part of the progress that was being made." Gilpin says that is far different from the case of Ghana, where an already strong middle class is pushing the government to invest new oil profits in infrastructure. "The middle class has been very effective in political participation," he said. "They have also been effective in ownership not just of jobs but also wealth. That is a lot more sustainable and leads to a lot more stability." In Morocco, steady growth in revenue per capita has boosted the middle class from 40 percent of the population to more than 50 percent of the population over the last ten years. 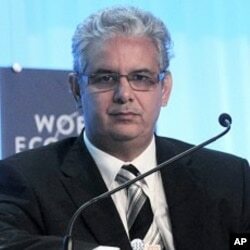 Economy Minister Nizar Baraka says it is as much about economic access as it about wealth. "Middle class is not only a problem of revenue," said Baraka. "We think that the most important thing is to have this feeling of being included in the middle class, because that means that we have hope to have a better life and to have a better future for our people." Over the next 20 years, the World Bank estimates that there will be 43 million sub-Saharan Africans in the middle class, most in growing economies including South Africa, Zambia, Nigeria, Kenya, and Ghana. Gilpin says a better-educated and wealthier electorate is generally less prone to political manipulation and more vigilant about public finance. "People in the middle class, as they grow in both influence and wealth, want to ensure that participation is assured so they can have a say in how their tax dollars are being spent, or they can have a say in the direction in which the country is going," he added. That puts pressure on politicians to be more responsive. "It turns the tables from having the government feel that it should be served by the people to the people feeling, justifiably, that the government should be serving them," said Gilpin. Social activist Taoufik Ben Abdallah says the rise of the middle class as a force for political change in Africa is a warning to all repressive leaders. Abdallah says there is no logic to the forces that oppress people. After years of often supporting dictatorships, Abdallah says international institutions and the international community should now see that making security a priority over democracy is a false choice.